While Tiger Woods inevitably generates a frenzy of interest during his return to the European Tour, the continent has already got plenty to be excited about thanks to a new Spanish superstar in the making. 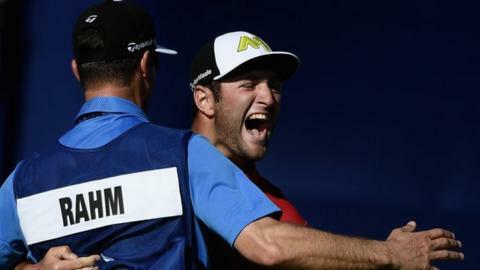 Jon Rahm's status as one of Europe's most exciting prospects was confirmed by a fine victory on the PGA Tour at Torrey Pines last Sunday. The 22-year-old capped his maiden triumph with a thrilling eagle at the last, where he holed a snaking 60-footer to finish three clear of the field. Rahm, who hails from Barrika in the Basque country of northern Spain, has made an extraordinary start to his professional career. He secured his Tour card within just four events of joining the paid ranks seven months ago. Having completed a stellar college career at Arizona State, where he won the prestigious Ben Hogan and Jack Nicklaus awards, the youthful Spaniard was third at Congressional last year before finishing runner-up at the Canadian Open last July. His rapid rise accelerated further with this victory over a strong field in California. It is little wonder Europe's Ryder Cup captain, Thomas Bjorn, was among the first to recognise the achievement. "Congratulations on your first PGA Tour win," Bjorn tweeted. "When you win, you might as well do it in style! What a finish." It is a significant result for Bjorn because it has elevated Rahm into the world's top 50. All indicators suggest the Spaniard, currently ranked 46th, is likely to remain in this upper echelon for many years to come. And with a place in the top 50 comes the freedom to pick and choose tournaments on both sides of the Atlantic. With his PGA Tour card secure, the Spaniard is on schedule to be free to accept European Tour membership in time for next year's Ryder Cup. Rahm has already stated his desire to play for Europe in Paris and under new rules would only need to play four events each season to satisfy the Tour's membership criteria. "I've thought about the Ryder Cup a lot," he said during the World Cup at the end of last year. "I so want to play in the matches; who doesn't? But right now I need to establish myself on the PGA Tour." That task has already been accomplished with astonishing speed and it means the 2018 Ryder Cup can be firmly on Rahm's radar. "The next one is in France and that is close to home for me," he said last November. "I will be doing all I can to be there. So to answer your question: yes, I will be joining the European Tour at some stage. "I am very much a European, and I want to play there. But I have taken a different route to professional golf in that I have gone to college in the US. "Once I have the freedom to fly back and forth a bit more it will happen. It is my dream to represent Spain in the Ryder Cup." Phil Mickelson's brother Tim coached him at Arizona State and is now the Spaniard's agent. Phil is convinced his sibling has unearthed a golfing gem. "I think there's an intangible that some guys have where they want to have the pressure, they want to be in that tough position," Mickelson said. "They want to have everything fall on their shoulders. And he has that." Before Rahm's sensational finish, Woods was the last player to win at Torrey Pines by making eagle on the closing par-5 back in 1999. Now the 41-year-old continues his latest comeback amid so many reminders the game is now being dominated by a much younger generation. Aside from Rahm's triumph, there have been PGA Tour successes this year for Justin Thomas (aged 23) and Hudson Swafford (29). Woods is heading for the Dubai Desert Classic on the European Tour where a similar story has been developing. After 26-year-old Tommy Fleetwood's Abu Dhabi victory, the 21-year-old Korean Jeunghun Wang collected his third title by winning in Qatar last Sunday. This week, of course, the largest galleries will gravitate towards Woods even though the 14-times major champion was less than convincing in his PGA Tour comeback last week. Rounds of 76 and 72 led to a missed cut and it was clear that understandable rust remains after such a lengthy lay-off. Woods has won twice in Dubai, but this time making the cut would represent satisfactory progress. He is playing the second of four events in a hectic five-week schedule. How his troublesome back stands up to the rigours of a 17-hour flight to the Middle East, even in the comfort of his private jet, will be Woods' primary concern. But the magnificent Majlis course at the Emirates Club, still the best in the Middle East, will provide an ideal test as he continues to feel his way back into Tour level competition. It will be fascinating to follow his progress but, given the way things are going, do not be surprised if he is overshadowed by someone nearer half his age by the time we get to Sunday's final round.